Laura strives for timelessness in her work. 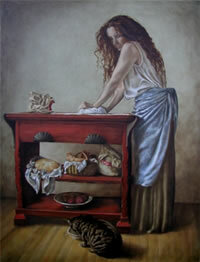 Her traditional painting style is perfectly suited to illustrate the unchanging nature of human experience. These are not figures as mere props, but reflections of our collective experience, our very human hopes, dreams, and emotions. Laura's landscapes stand out as portraits of the land. Painted using a monochromatic verdaccio (a grey-green with warm brown undertones that the Italian masters used for their under-paintings) and adding color only to sections of the canvas, she treats her subject like a portrait. This innovative approach creates inviting, peaceful scenes. 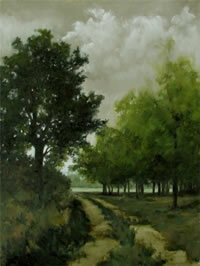 A member of the International Guild of Realism, Laura den Hertog has exhibited widely in North America, and the UK. Her paintings have graced the covers of various magazines and books and in 2005 she was featured and interviewed for PBS television. Her work is included in The New Reality: The Frontier of Realism in the 21st Century, a 3 year long Museum tour in the USA. The artist lives and works in a small town outside of Montreal. 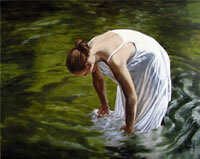 Her paintings can be found in exhibits and private collections worldwide.